Update, (3 p.m.): James Szymanski and Jack Taddeo of Shoreham-Wading River both closed out their careers with the Wildcats as all-state wrestlers. Szymanski finished fourth at 132 pounds and Taddeo was fifth at 145. Szymanski lost in the consolation finals 8-0 against Da`mani Burns of Newburgh. Taddeo closed out the tournament with a win. He defeated Danny Murphy of Roy C Ketcham in the fifth/sixth consolation final, 7-4. Both wrestlers will continue training for the upcoming nationals. Update (2:15 p.m.): Riverhead senior Ed Matyka’s season came to an end with a 3-2 loss in the consolation finals against Gerard Daly of Minisink Valley. Matyka finished the tournament in fourth place at 120 pounds. Matyka trailed 3-0 in the second period before scoring on an escape. Late in the third period, he escaped again to close within 3-2. He nearly scored a takedown a few seconds later, but they went out of bounds before he could secure the move. Matyka closes out his career with 99 victories. He went 4-2 in the state tournament. Update (1:30 p.m.): Shoreham-Wading River senior James Szymanski grinded out a hard-earned overtime victory in the consolation semifinals at 132 pounds. Szymanski and Evan Barczak of Monroe-Woodbury were tied at one up until the final ultimate tie-breaker period. Szymanski was on top and needed to ride out the period in order to win. He did just that and was awarded a 2-1 win in a rematch of the first round. Neither wrestle could gain any advantage on each other. They each scored on an escape before overtime for the only points. But those escapes were hard to come by in overtime. Neither wrestler would let the other free, leading to the final sudden-death period. Szymanski will wrestle for third place now. His teammate, Jack Taddeo, lost his 145-pound consolation final, 3-0 against Jake Einbinder of Bethpage, the No. 2 seed in the tournament. Taddeo will wrestle for fifth place now. Update (1 p.m.): Ed Matyka of Riverhead rallied back from a three-point hole to defeat Vincent Vespa of Monroe-Woodbury in the 120-pound consolation semifinals, 6-4. Matyka will wrestle in the consolation finals for third place now and also for his 100th career win. Matyka scored a reversal with about 1:15 left in the third period to tie the match at 4 and then scored two more late in the period to win. Matyka dominated the third period to earn his 99th career win and fourth straight at the state tournament after falling in the first round. 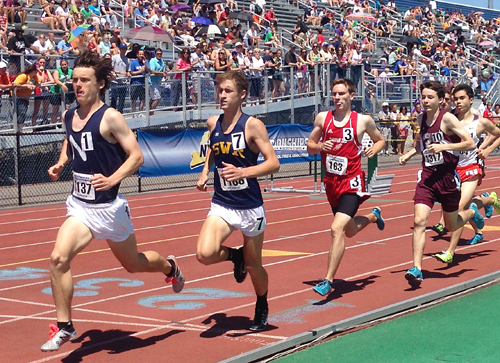 Update (11:35 a.m.): Shoreham-Wading River senior Jack Taddeo joined his teammate on the podium. Taddeo won a 5-3 decision in his first wrestleback Saturday against Mike Laloggia of Webster Schroeder to secure himself an all-state finish. Taddeo, wrestling at 145, controlled the match throughout. He scored a quick takedown for a 2-0 lead in the first period. Laloggia evened the score with an escape in the first and another point in the second. Taddeo started on bottom for the third period and escaped immediately for a 3-2 lead. He added two more points to go ahead 5-2 and then held on as Laloggia got one more escape point in the final seconds. Taddeo will wrestle twice more today. There will be no state champion for Shoreham-Wading River this season. But the Wildcats still have a chance for a memorable finish.